IBM BigFix Inventory application update 9.2.14. BigFix Inventory reports utilization of the Registered User metric for Adobe Creative Cloud (Adobe CC) products. The information is extracted during regular software scans directly from computers where Adobe Creative Cloud products are installed. Based on the scan results, the Registered User metric is displayed on the All Metrics report. Detailed information about users is shown on the Software Users report. Benefits: Thanks to this feature, you can track licenses for Adobe CC products to analyze trends, define thresholds and optimize costs by identifying users of unused instances. You can now tag software components, or instances of the discovered software to classify them. The tags might, for example, emphasize the ownership of a software product, categorize it as a test or free of charge instance, or mark it as blacklisted or approved. Benefits: The reports allow more flexibility and can be customized to carry additional information about software products that are specific to your business. Information about the usage of Floating User metric is now available on the All Metrics report for IBM Rational products. The calculations are available thanks to the integration with IBM Rational License Key Server. The usage is provided in the .slmtag files. Benefits: License consumption for IBM Rational portfolio can be monitored and analyzed. The newest additions to the new BigFix Inventory dashboard include the summary of the most important inventory data, recent changes, discovery gaps, and security issues in one place. The dashboard is also extended with quick search that allows you to easily find information related to file hashes, file names, vulnerabilities and software components. Benefits: Improved dashboard experience that makes the summary of the most important information available at a single view. By comparing the classification of the SHA-256 checksums with the information from IBM X-Force Exchange portal, BigFix Inventory displays the reputation of the discovered files on the Scanned Data report. Thus, you can quickly identify which files in your environment pose malware threats. Benefits: Thanks to the information about file reputation, you can better identify malware threats in your environment. You can use a new REST API request to migrate software classification, for example, when moving agents between the instances of the BigFix servers. Benefits: Thanks to the new REST API, you can easily migrate the software classification. The software catalog is extended to discover new components from Citrix, Oracle and SAP. 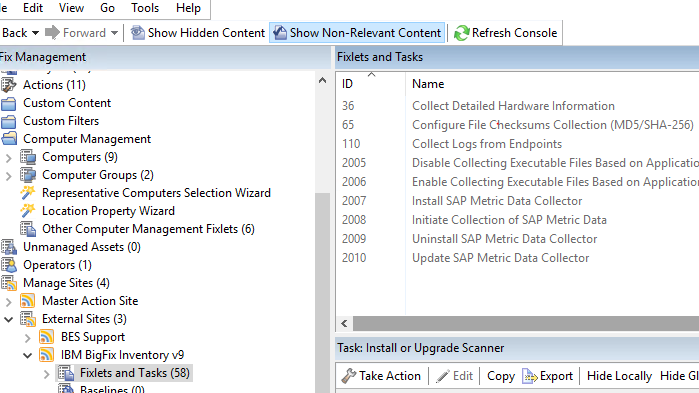 To discover the components, ensure that you upgrade BigFix Inventory to version 9.2.14. Below is the list of the most important newly added components. To learn about their exact versions, use the Software Catalog widget in BigFix Inventory to browse the catalog content. Benefits: More visibility into deployed products and components and better license management without the need to develop custom signatures. The end of support dates are automatically populated for Microsoft software that according to information provided on 20 November 2018 is announced to be out of support between 30 November 2015 and 1 November 2021. Benefits: The information about the end of support dates for the Microsoft software used in your organization is up-to-date and thus, you can prepare for the forthcoming software updates. o	To maintain security, Java is upgraded to the newest version: 8.0.5.25.
o	WebSphere Application Server Liberty is upgraded to version 18.0.0.3.
o	Update of the Xerces library to version 3.2.1 on Solaris Sparc and Solaris x86 to keep the scanner secure and reliable. •	SLES 11 for PowerVM on Power9 in Power8 compatibility mode. •	SLES 12 for PowerVM on Power9 in native mode. •	SLES 15 on Power9 with disconnected scanner in P9 native mode. •	Oracle VM Server for x86, version 3.4.x. •	Solaris Kernel Zones on x86 without nested virtualization (not yet announced as IBM subcapacity eligible). The release notes are not showing the actual Fixlet name for some of the items as they have in the past. Hi Alexa, the release notes contain the correct fixlet information. The names are current. The fixlets suggested by you are different from the ones that changed. Odd, because I don’t see those and never had. Well, I am not sure why that is. They both should be available under the BigFix Inventory site. For more information, check out our documentation with a full list of fixlets and tasks available: http://www.ibm.com/support/knowledgecenter/SSKLLW_9.5.0/com.ibm.bigfix.inventory.doc/Inventory/overview/r_fixlet_list.html. I would be interested in seeing a screenshot of anyones Console showing fixlets named “Collect Logs from Endpoints” and “Upgrade to the latest version of 9.x”. Thank you! I see them. I wasn’t looking at the Site View; rather the Domain view. What threw me off is that those particular fixlets have never been listed before in the doc (that I recall). It usually mentions the upgrading of the scanner, etc. I should have look more deeply into it.